Glaucoma, a group of diseases causing optic neuropathy, is characterized by optic nerve head changes and visual field loss, and is the second leading cause of irreversible blindness across the world [1, 2]. In 1995, the World Health Organization reported that 5.1 million people were bilaterally blind from glaucoma . Glaucoma is expected to affect 79.6 million people worldwide by the year 2020 . Its morbidity and prevalence make it a significant public health problem . However, to date, the pathogenesis of glaucoma remains largely unknown, with both genetic and environmental factors contributing to the pathophysiology [1, 3]. Over the last decade, the application of molecular genetic techniques to the study of glaucoma has been accelerated greatly, and the accumulating evidence supports an important role for genetics in determining risk for this disease . Apolipoprotein E (APOE), which is a major apolipoprotein in the central nervous system, plays an important role in the uptake and redistribution of cholesterol within neuronal network . APOE gene is located on human chromosome 19q13.2 and is polymorphic [5, 6]. There are three common APOE isoforms E2, E3 and E4, encoded by different alleles (ε2, ε3 and ε4), which vary significantly in structure and functions . APOE gene ε2/ε3/ε4 polymorphism has been associated with several neurodegenerative diseases such as Alzheimer's and Parkinson's diseases [8, 9]. Therefore, it is possible that this polymorphism may be associated with glaucoma risk . Recently, a number of studies have been conducted to investigate the association of APOE gene ε2/ε3/ε4 polymorphism with glaucoma risk [11–25]. However, the results are controversial with some reports showing positive association [13, 15, 18–21, 24, 25] while others showed no association [11, 12, 14, 16, 17, 22, 23]. The inconsistent conclusion may be due to the relatively small size of subjects, since small sample sized association studies could be very limited for efficient assessment of the association. Integration of these studies may provide improved statistical power to detect the significance. Meta-analysis is a statistical procedure for combining the results of several studies to produce a single estimate of the major effect with enhanced precision . Recently, two studies assessed the association of APOE gene ε2/ε3/ε4 polymorphism with primary open angle glaucoma (POAG) by using meta-analysis [27, 28]. Their meta-analyses suggest that this polymorphism is not associated with POAG susceptibility. However, the results of their meta-analyses should be interpreted with caution due to some potential limitations. Therefore, in this study, we conducted a meta-analysis to derive a more precise estimation of the association between APOE gene ε2/ε3/ε4 polymorphism and the risk for glaucoma. This meta-analysis was reported according to the Preferred Reporting Items for Systematic Reviews and Meta-Analysis (PRISMA) Statement, issued in 2009 (Additional file 1: Table S1). Electronic databases, including PubMed, Excerpta Medica Database (EMBASE), Cochrane, Elsevier Science Direct and China National Knowledge Infrastructure (CNKI) databases, were searched for identification of the studies on APOE gene polymorphisms and glaucoma published up to January 5, 2014. Search terms included ‘glaucoma’ and ‘apolipoprotein OR APOE OR Apo E OR ApoE’. There was no language restriction. Review articles and original papers were searched by hand for additional eligible studies. The following criteria were used to select the eligible studies: (a) evaluation of the association between APOE gene ε2/ε3/ε4 polymorphism and glaucoma risk; (b) an unrelated case–control study in which family members were excluded; (c) sufficient published data for estimating an odds ratio (OR) with 95% confidence interval (CI). When authors reported two or more publications on the same patient population, only the largest study was selected. Additionally, when a study reported the results on different subpopulations, we treated them as a separate study. Information was carefully extracted from all eligible publications independently by two investigators. Disagreement was resolved by discussion between the two investigators. The following data were collected from each study: the first author’s name, publication year, source of publication, ethnicity, sample size (numbers of cases and controls), types of glaucoma, and allele as well as genotype frequencies. Authors were contacted for further information when necessary. Pooled OR with 95% CI was used to assess the strength of association between APOE gene ε2/ε3/ε4 polymorphism and glaucoma risk. The significance of the pooled OR was determined by Z test. Genotype ε3ε3 is the most common genotype . Thus, genotype ε3ε3 or allele ε3 is designated as reference category in the present study. We estimated the risk of the ε2 and ε4 alleles, compared with the ε3 allele. We also performed genotypic analyses (ε2 carriers versus ε3ε3, ε2ε2 versus ε3ε3, ε4 carriers versus ε3ε3 and ε4ε4 versus ε3ε3). ε2 carriers were defined as patients with the ε2ε2 and ε2/ε3 genotypes. ε4 carriers were defined as patients with the ε3ε4 and ε4ε4 genotypes. Genotype ε2ε4 was excluded from the genotypic analyses because of the opposite effect between ε2 and ε4 alleles [15, 30]. In addition, we performed subgroup analyses by ethnicity (Cauasians and Asians) and types of glaucoma (POAG) when the data were available. Subgroup analyses were also performed by excluding those studies which did not fulfill Hardy-Weinberg equilibrium (HWE). We carried out sensitivity analysis by excluding one study at a time to explore whether the results were influenced by a specific study. Heterogeneity (between-study inconsistency) was investigated and measured using Cochran’s Q statistic and I 2 statistic [31, 32]. A P value greater than 0.10 indicated a lack of heterogeneity among studies, so the fixed effect model (Mantel-Haenszel method) was used to calculate pooled OR . Otherwise, the random effect model (DerSimonian-Laird method) was used . Publication bias was detected using Egger’s linear regression test by visual inspection of funnel plot . A Chi square-test was used to evaluate the deviation from HWE in controls. All analyses were done with the software Review Manager (v4.2; Oxford, England) and Stata statistical software (v10.0; StataCorp, College Station, TX, USA), using two-sided P values. P values were Bonferroni adjusted to account for multiple testing. In overall analyses, P values below 0.0083 (0.05/6) were considered statistically significant, and, in subgroup analyses, P values below 0.0042 (0.05/12) were considered statistically significant. Characteristics of studies investigating the association of APOE gene ε2/ε3/ε4 polymorphism with glaucoma risk are presented in Table 1[11–24]. The study selection process is shown in Figure 1. There were 666 articles relevant to the searching terms (PubMed: 51; EMBASE: 95; Cochrane: 0; Elsevier Science Direct: 513; CNKI: 7). Nineteen studies examined the association between APOE gene polymorphisms and glaucoma. Three studies did not explore the ε2/ε3/ε4 polymorphism and were excluded [36–38]. One study was excluded due to duplicate report , and another study was excluded due to unavailable data . Krumbiegel et al. provided data on two different subpopulations (German and Italian), and, thus, each subpopulation was treated as a separate study. Finally, a total of fifteen separate studies including 2,700 cases and 2,365 controls were included in the present meta-analysis [11–24]. *HWE: Hardy-Weinberg equilibrium; PEXG: pseudoexfoliation glaucoma; POAG: primary open angle glaucoma; PACG: primary angle closure glaucoma; NA: not available. #Only allele frequency was extracted from the study. The allele and genotype frequencies of APOE gene ε2/ε3/ε4 polymorphism were extracted from fourteen separate studies [11–22, 24]. Only allele frequency was extracted from the study by Ressiniotis et al. . The results of HWE test for the distribution of the genotype in control population are shown in Table 1. The genotype distributions in eleven separate studies were in agreement with HWE. The genotype distributions in 3 separate studies were not in agreement with HWE. It was unavailable for the study by Ressiniotis et al. to perform HWE test. The fifteen studies consisted of eight Caucasian studies and seven Asian studies. Of these studies, two studies were conducted in patients with pseudoexfoliation glaucoma (PEXG), eleven studies were conducted in patients with primary open angle glaucoma (POAG), and two studies were conducted in patients with POAG and primary angle closure glaucoma (PACG). 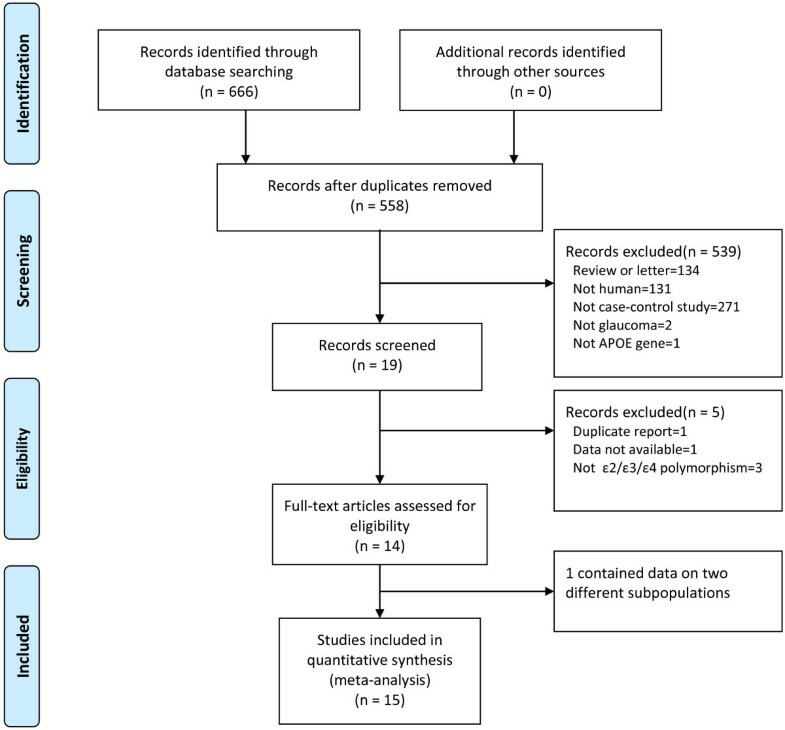 The results of the meta-analysis on the association between APOE gene ε2/ε3/ε4 polymorphism and risk of glaucoma are shown in Table 2. By pooling all the studies, APOE gene ε2/ε3/ε4 polymorphism was not associated with glaucoma risk (P > 0.0083). We detected significant between-study heterogeneity for the contrasts of ε2 versus ε3, ε2 carriers versus ε3ε3, ε4 versus ε3 and ε4 carriers versus ε3ε3 in overall population (P < 0.1). We carried out subgroup analyses by excluding those studies which did not fulfill HWE, and found similar results (P > 0.0042). Significant between-study heterogeneity for the contrasts of ε2 carriers versus ε3ε3, ε4 versus ε3 and ε4 carriers versus ε3ε3 was detected in HWE population (P < 0.1). *POAG: primary open angle glaucoma; HWE: Hardy-Weinberg equilibrium; vs: versus; OR: odds ratio; CI: confidence interval; F: fixed effect model; R: random effect model. When stratified by ethnicity, no association was found between APOE gene ε2/ε3/ε4 polymorphism and risk of glaucoma in Caucasians (P > 0.0042). No significant between-study heterogeneity was found in Caucasians (P > 0.1). In Asians, we detected an association of the ε4ε4 genotype with elevated risk for glaucoma (OR = 5.22, 95%CI = 1.85-14.68, P = 0.002). But we did not find significant association of APOE gene ε2/ε3/ε4 polymorphism with glaucoma in other models (P > 0.0042). Significant between-study heterogeneity was found for the contrasts of ε2 versus ε3, ε2 carriers versus ε3ε3, ε4 versus ε3 and ε4 carriers versus ε3ε3 in Asians (P < 0.1). In subgroup analysis by types of glaucoma, we also detected an association of the ε4ε4 genotype with elevated risk for POAG in Asians (OR = 4.98, 95% CI = 1.75-14.20, P = 0.003), but not for POAG in Caucasians (P > 0.0042). In POAG population (Asians), we detected significant between-study heterogeneity for the contrasts of ε2 carriers versus ε3ε3, ε4 versus ε3 and ε4 carriers versus ε3ε3 (P < 0.1). For most of comparisons, the shapes of the funnel plots did not reveal any evidence of obvious asymmetry (funnel plots not shown), and these results were further supported by analysis via Egger’s linear regression test (Table 3). We only found publication bias for the contrasts of ε4 carriers versus ε3ε3 in overall population and HWE population, ε4 versus ε3 as well as ε4 carriers versus ε3ε3 in Asians and POAG (Asians) subgroup (P < 0.05). Additionally, Egger’s test was not applied in the contrast of ε2ε2 versus ε3ε3 in Asians and the contrasts of ε2ε2 versus ε3ε3 as well as ε4 carriers versus ε3ε3 in POAG (Asians) subgroup due to the rare frequency of homozygous mutation. *POAG: primary open angle glaucoma; HWE: Hardy-Weinberg equilibrium; vs: versus; CI: confidence interval; NA: not available. We carried out sensitivity analysis by excluding one study at a time to explore whether the positve result of POAG (Asians) subgroup were influenced by a specific study. Sensitivity analysis indicated that a significant variation in combined ORs by excluding the study by Al-Dabbagh et al. (OR = 4.01, 95% CI = 1.29-12.46, P = 0.02) or the study by Yuan et al. (OR = 4.04, 95% CI = 1.30-12.50, P = 0.02) or the study by Tamura et al. (OR = 4.62, 95% CI = 1.54-13.90, P = 0.006). Recently, two studies assessed the association of APOE gene ε2/ε3/ε4 polymorphism with POAG by using meta-analysis [27, 28]. Their meta-analyses suggest that this polymorphism is not associated with POAG susceptibility. However, the results of their meta-analyses should be interpreted with caution due to some limitations. In the study by Song et al. , the authors did not include all available published studies. Five eligible studies were not include in the meta-analysis [13, 15, 17, 21, 23]. Meanwhile, two studies contained overlapping data [19, 39], and only the largest study  should be selected for the analysis. In another study by Wang et al. , there were many mistakes in the data extraction (see Supplementary Table two in their article). For example, the authors confused the cases and controls for the study by Zetterberg et al. . The data provided by the authors for the study by Vickers et al. were not in line with the data provided by Vickers et al. in their original publication. Close inspection of the data in the study by Jia et al. revealed that the number of the ε2, ε3 and ε4 alleles in cases should be 34, 278 and 40, but not 34, 280 and 38 in the study by Wang et al.. These limitations distorted the results of their meta-analysis. In the present study, we systemically reviewed all available published studies and performed a meta-analysis to derive a more precise estimation of the association between APOE gene ε2/ε3/ε4 polymorphism and susceptibility to glaucoma. Our meta-analysis included fifteen separate studies involving 2,700 cases and 2,365 controls. In Asians, we detected an association of the ε4ε4 genotype with elevated risk for glaucoma, mainly for POAG. Thus, the ε4ε4 genotype may be associated with elevated risk for POAG in Asians. Glaucoma is a term describing a group of ocular disorders with multi-factorial etiology united by a clinically characteristic intraocular pressure-associated optic neuropathy [1, 40]. This disease often goes undetected. In the United States, glaucoma is responsible for 9-12% of blindness, and impacts up to three million Americans, but only half of those are aware they have it . Glaucoma is a neurodegenerative disease, which is often associated with high intraocular pressure [10, 42]. In this disease, there are cell bodies (retinal ganglion cells) and nerve fibers (optic nerve axons) that are vulnerable to degeneration and amenable to protection. Neurodegeneration occurs in the retinal ganglion neuronal cell bodies, their axons in the optic nerve, the lateral geniculate nucleus, optic radiation, and visual cortex [43, 44]. APOE plays a key role in lipid metabolism, cholesterol transport, as well as protein synthesis, and is also involved in numerous other functions, including tissue repair, cell growth and differentiation, and immune response and regulation [4, 45]. APOE gene ε2/ε3/ε4 polymorphism has been associated with a number of neurodegenerative diseases such as Alzheimer's and Parkinson's diseases [8, 9], raising the possibility that this polymorphism might predispose to neurodegeneration of the retinal ganglion cells and the optic nerve axons in glaucoma. In the study, we found that the ε4ε4 genotype is associated with elevated risk for POAG in Asians. The extracellular accumulation of insoluble fibrillar peptides in brain parenchyma and vessel walls as amyloid is the hallmark of neurodegenerative diseases . Amyloid β-peptide (Aβ) deposition in senile plaques and cerebral vessels is a neuropathological feature of Alzheimer’s disease . There is evidence that the amount of histologically identified Aβ in vessels and plaques in the cerebral cortex of patients with Alzheimer’s disease is a direct function of their APOE genotype, and subjects with ε4ε4 genotype have an increased amyloid deposits in vessels and density of strongly Aβ-immunoreactive plaques than those with ε3ε3 genotype . Numerous similarities exist between glaucoma and Alzheimer's diseases , and, thus, the evidence supports our results. However, the exact function of APOE gene ε2/ε3/ε4 polymorphism remains largely unknown, and studies of the functional implications of this polymorphism are still needed in the future. Additionally, we found that the ε4ε4 genotype is associated with elevated risk for POAG in Asians, but not in Caucasians, which indicated that the genetic background of Asians and Caucasians is different. Some limitations of this meta-analysis should be acknowledged. A first consideration is that we found publication bias for some contrasts. A second consideration is that significant between-study heterogeneity was found in some comparisons, which may be distorting the results of meta-analysis. In the subgroup analysis by ethnicity, the heterogeneity disappeared among Caucasians. The heterogeneity may have resulted from differences in the subjects’ genetic backgrounds. Additionally, different types of glaucoma may contribute to the heterogeneity. But most of studies did not provide glaucoma subtype information (e.g., normal tension glaucoma or high tension glaucoma). Third, though we detected an association of the ε4ε4 genotype with elevated risk for glaucoma (with POAG and PCAG combined) in Asians, only two studies were conducted in patients with PACG (109 patients). Thus, further studies exploring the association between APOE gene ε2/ε3/ε4 polymorphism and PACG risk are still needed. Fourth, sensitivity analysis indicated that a significant variation in combined ORs by excluding some studies. Finally, our results are based on unadjusted estimates, which may be distorting the results of meta-analysis. A more precise analysis stratified by environmental factors could be performed if individual data were available. In summary, the present meta-analysis suggests that APOE gene ε4ε4 may be associated with elevated risk for POAG in Asians. However, more epidemiologic studies based on larger sample size, case–control design and stratified by ethnicity as well as types of glaucoma are suggested to further clarify the relationship between APOE gene ε2/ε3/ε4 polymorphism and genetic predisposition to glaucoma. This work was supported by Anhui Provincial Natural Science Foundation (1408085MH158). S-LL, YW, Y-FZ, B-YZ and Z-YG conceived and designed the study. S-LL, YW, Y-FZ, B-YZ and Z-YG took part in literature review and data extraction. S-LL and YW were involved in software used and data analysis. S-LL, YW, Y-FZ, B-YZ and Z-YG wrote the paper. All authors read and approved the final manuscript.